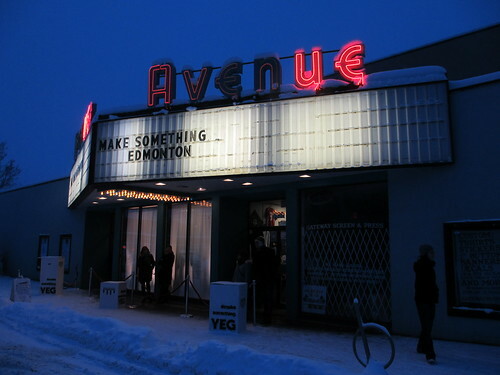 Tonight a few hundred Edmontonians gathered at the Avenue Theatre on 118 Avenue to celebrate the launch of Make Something Edmonton. With lots of buzz about the initiative but few details on the launch event itself, attendees arrived both excited and curious. Something was happening, but what? How would the evening unfold? Sharon and I caught the specially chartered ETS shuttle from City Hall which dropped us off right in front of the theatre. It turns out our driver, who was just 19 years old, had only moved to Edmonton a couple of months ago. He’d always wanted to be a bus driver, he told us, and he came here to make it happen! While enjoying the ride we chatted with The Local Good’s Tad Hargrave, catching up on one another’s projects and blueskying Make Something Edmonton. That sort of set the tone for the evening. We found the Avenue Theatre already buzzing with activity when we got there just after 5:30pm. Volunteers scanned tickets, checked coats, and welcomed us. We entered the theatre and found it completely transformed. The seating was gone, and the space had been converted into a two-level open room, with tables around the edges and the stage at the front. There were lights, cameras, food, and the pleasant sounds of connections being made and ideas being spread. We split up and said hi to as many people as we could. It was a veritable who’s-who of the hyper-engaged in attendance, and I felt like every direction I looked there were familiar faces to greet. 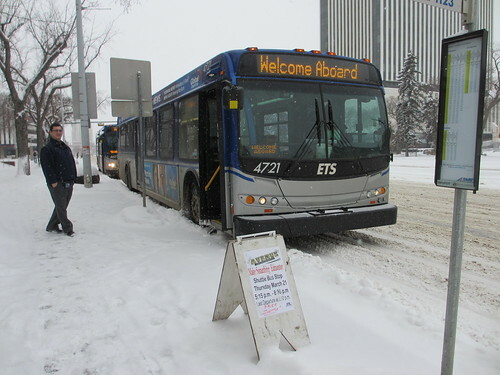 People continued to pour in and after a few brief delays to ensure the shuttles could all make it through the snow, the formal program got underway. Mayor Mandel took the stage first to welcome everyone and to say a few things about the project. I had managed to snag a few minutes with him just before the program began, and he seemed totally pumped about Make Something Edmonton. Who cares what people outside the city think, he told us. What matters is getting Edmontonians on board with the idea that Edmonton is a great place to make something. If we can do that, the rest will come. 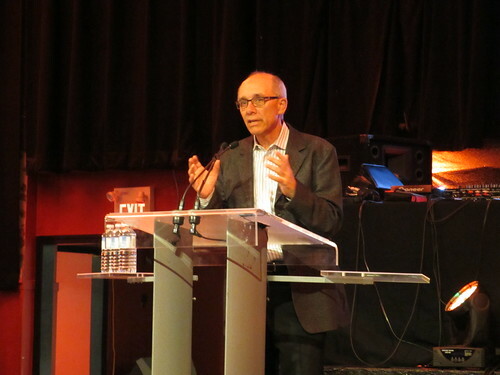 Mayor Mandel then brought Randy Boissonnault, a local entrepreneur, literacy advocate, and public speaker, to the stage. 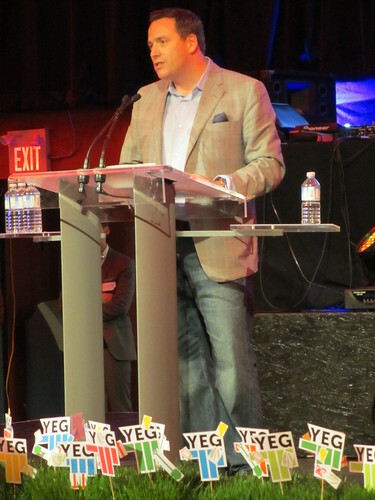 As our MC for the evening, Randy shared a few introductory thoughts and then welcomed Todd Babiak to the stage to provide some history. I really feel like tonight was Todd’s night. 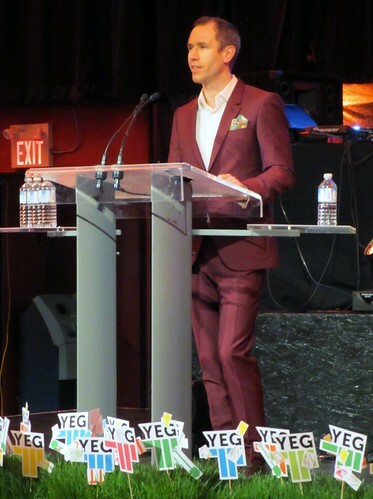 He would probably tell you that Edmontonians are the ones who came up with Make Something Edmonton, but he’s the one who listened to what we had to say and helped us put our thoughts into words. Todd spoke of Edmonton’s history of collaborating and building, and of our struggles with civic identity. He framed Make Something Edmonton as our city’s story, and noted that “a story is about choice.” Some in the room had made the choice to come to Edmonton, others had made the choice to stay. Next we heard from four makers. Lewis Cardinal kicked things off by discussing the importance of our city’s history. He introduced words like Pehonan and Monto. Our pehonan (“gathering place”) is where Edmonton was born, the area we now call the Rossdale Flats. Monto, which is found in our city’s name – Edmonton – refers to our spirit. You can learn more in the Spirit of Edmonton presentation. 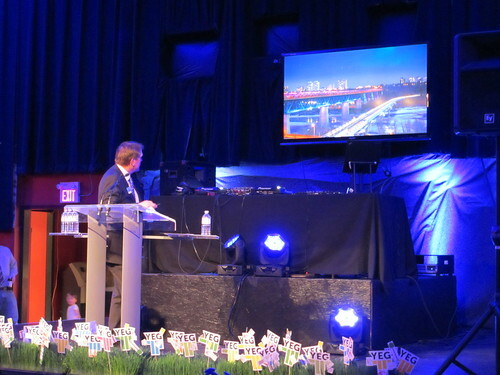 The second speaker was Dave Mowat, who shared his idea for lighting up the High Level Bridge. It would take 45,360 LED bulbs to light the bridge, he told us, and the money for the project will come not from the government, but from Edmontonians themselves. His presentation was a lot like the one he delivered at Pecha Kucha 14, but with some new visuals to help illustrate the idea. 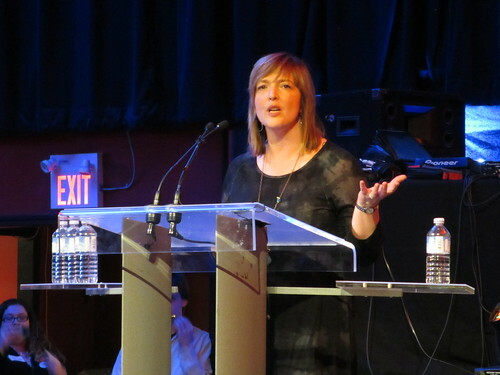 Third was Christy Morin of Arts on the Ave. She welcomed everyone to Alberta Avenue and gave some background and context to the ongoing revitalization of the area. The initiative got underway over eight years ago because she was sick of the crime and knew the community could be different. “The beauty that hides behind the crime and grime,” is what she wanted to help expose. 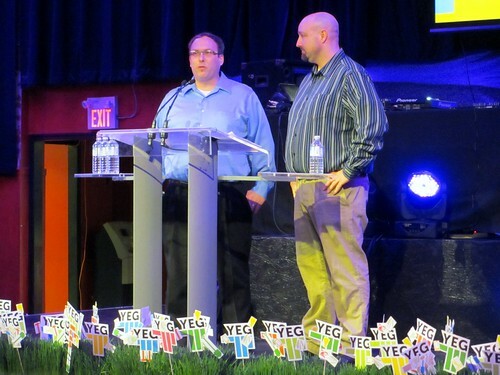 The final presentation was from Rob and Kirk who are looking to launch the Edmonton Keg Roll. They got the idea from the annual Cheese Rolling event that takes place near Gloucester in England. So why a keg roll? “Edmonton isn’t known for its cheese making,” they told us, “but we do make fine beer.” The winner will get, appropriately, a keg of beer. Their presentation was my favorite, both for its whimsy and for its seductive simplicity. Make Something Edmonton co-chair Chris LaBossiere brought the formal program to close by thanking all of the volunteers and attendees, and by introducing the rest of the makers who were in the room. In addition to the featured makers, attendees could check out the Edmonton Bicycle Commuters, Make Jen’s Day, The Found Art Project, Gillian’s Just Right, Little Warriors, Edmonton’s Next Gen, and The Startup City Project. Chris highlighted the fact that Make Something Edmonton needs to “change the culture of our whole city,” to make it easier for projects to move forward. “Welcome to Edmonton, what are you making, how can I help?” is how he described the new approach. Explore how your neighbours are making the city more fun, more beautiful, more caring, more profitable, sillier and sassier and stupider and smarter. Join them, help them, launch your own project. There are already a couple of dozen projects up on the site, and I’m sure we’ll see many more added over the next few days. A city is not like a new soap or a box of cookies or a chain of restaurants. How can you sum up the spirit of a million people in a few words, a pretty logo, a big sign at the corporate limits? This city does have a story. It does have an identity. It does have a spirit. Make Something Edmonton is an evocation of that spirit. I want to say a big congratulations to Toscha Turner, Thomas Scott, and the entire event subcommittee who worked really hard to make tonight happen. The “YEG Heads” were great, the livestreaming via the Edmonton Journal seemed to work well, and there were lots of volunteers on hand to ensure everything went smoothly. 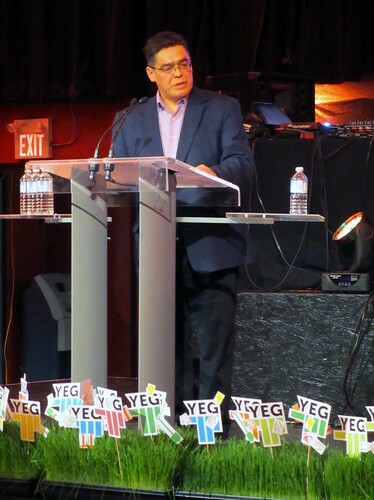 It feels great to have Make Something Edmonton out in the open, and tonight’s event was a great way to kick that off! 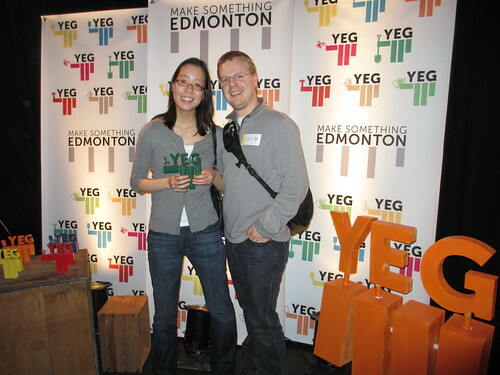 Stay tuned to Make Something Edmonton on Twitter at @makeitYEG and on Facebook. You can check out more of my photos from the evening here, and you can re-watch the video here. What are you making? How can I help?